Update about my time in Banff - Jamie McDonald: AdventureMan, Author, Speaker. Superhero Foundation. Having spent a crazy day speaking to the police and the media, I wanted to update everybody who’s been kind enough to read, share and care. My bag, including my possessions, priceless hours of footage of my journey across Canada and my wallet, amongst other things, has been found. The bag did not have, as some have asked, any donation money in it – the vast majority of which has been donated online. In instances when it’s been given to me, I bank it as quickly as possible. Some of you may know that I was attacked in the early hours of New Year’s Day in Banff and that I left quickly after the unprovoked attack, leaving my bag. I was told it had been taken. I reported the incident to the police today, including what I remembered of the three attackers. The police have been phenomenally supportive. I would like to make it clear that none of this happened in Earls Restaurant in Banff, where I spent some time on New Year’s Eve. I had gone on to another place. I have nothing but good things to say about Earls Restaurant, I had a great time there. I would also like to make it clear that throughout this journey, I have been accepting the very welcome and gracious hospitality of strangers and spending my own money, which as I’ve said elsewhere, I saved in order to get a mortgage, but decided to use for this journey instead. Every single penny I’ve received in donations has and will continue to go to the causes I am running for. On that note, I have been amazed at the response, from friends and strangers and from the British and Canadian media, both of which have helped spread my story. I wish the story didn’t have to have an unfortunate incident in order to reach people, but I’m glad in a way because the more people that know about my journey, the more children it might be able to help. As the saying goes, every cloud has a silver lining and the additional donations as a result of people hearing about this are hugely appreciated. As I mentioned earlier, I’m physically fine and was obviously very shaken up, but the support has been incredible. Although I’d been told my bag had been taken, it appears that whoever did so had a change of mind, as the bag was found at/near the place I left after the attack. Again, to make it clear, there was no donation money in the bag, but I had approximately $300 of my own money in it and that was taken. I would like to thank you all again, especially the people of Banff, who’ve shown me the most incredible hospitality, and as I told a journalist here, I’d like to say that this doesn’t affect my thoughts about Canada one bit – I’ve had the best experiences here and the world-famous Canadian hospitality has been proved to be anything but a stereotype. I can’t wait to get back out on the road and continue the run, now! If you’d like to donate to the causes for sick children I’m supporting, please do so by clicking this link. 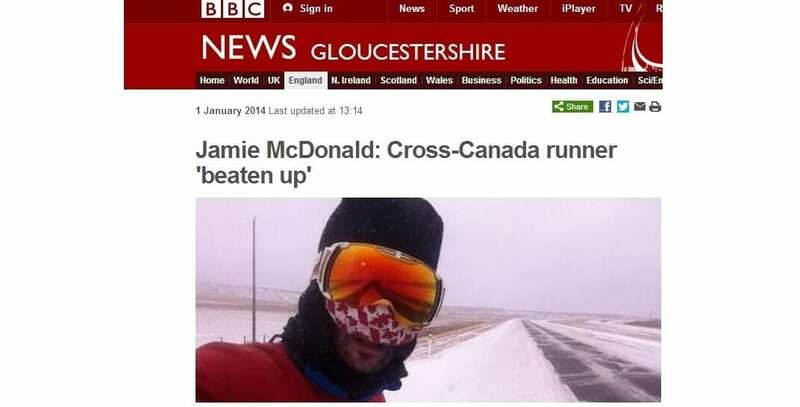 That is great news Jamie, keep going. You can’t keep a good Gloucester bloke down!!! Thank God you have your bag back..hope you are not hurt to bad. with at least a Doctor, if you do not want to go to the hospital. As for those who attacked you..I would like to cut off their b…s ! Keep up the good cause. Yaaaaaay, Jamie!! So glad you got your bag back but even happier that you are ok and that so many people had your back. Bless you and the rest of your journey. Only in Canada where you can get a a handshake, a brew, then robbed and everything returned all from the same person. Remember to always take the high road, should you judge us. So glad that everything has been found, and you are fine. You are such a wonderful human being for all you have done and will continue doing… Hard to believe people need to be so violent in this world… All the best to you in the days, weeks, months ahead as you finish you amazing journey and recover when you complete it!!! Thank you from everyone who has needed te children’s hospitals, who may need them in the future and the people (like myself) who know what amazing thugs are done in them! Happy new year!!! I’m heading back to the UK for work on Sunday – I’ll be sure to give you a shameless plug to everyone I speak with during my time there (I talk a lot!) along with a bit of chiding because we Canucks are winning the donation competition by a substantial margin. Enjoy the rest of your time here – we will keep watching as you conquer the Rockies and have your glorious parade into Vancouver – Vantown is a great city…hope you will have some time to check it out before heading home to Blighty. All the best to you – keep safe, keep warm and know that there are a lot of people rooting for you! thank god the person/persons that took your stuff had a change of heart and your got everything back. i have been following your trip through friends in Canada and i am so proud of you and your journey to help sick children. God is watching over you and will be by your side through the last 600 miles. God Bless you and keep you safe. I will be continuing to watch this all unfold. Thank goodness you’re alright, Jamie! I was horrified when I stumbled onto this story today on huffpost.uk. We’re so lucky to have you here in Canada! I hope that the rest of your tremendous journey goes very well. Amazing story Jamie. I brought my kids to meet you in Regina because I had a feeling you were just one of those special people in the world trying to make a difference. You are very much that person. Keep on driving forward. Stay safe!! Oh Jamie, I am so terribly sorry that something so awful has happened to you. I am glad you are OK and have been given back all your belongings. Hope you are near the end of your journey and that you will take a well needed rest. All the best from all my daughters and myself for 2014, Happy New Year!! Jamie, you my friend are a saint. As a father of a little girl who beat brain cancer, Danielle, and a friend of Penny and Trevor and Brygette of Newfoundland who also has a lot to be thankful to Sick Kids Hospital for. Your spirit even in response to what has happened with your attack brought a tear to my eye. As a runner, I am inspired by your ability to do what you are doing. Know that 1000s of Canadians are with you every step of the way when you finish your journey. God bless you for being a beakon of hope and a source of inspiration for everyone!! You, are a great man, and I am looking forward to reading your book when this is all done. I am deeply saddened to think such a situation could or would happen. What on earth were those people thinking? I am so glad there are people on this earth like yourself; kind, generous,and grateful. Grateful for the care you received, so willing to pay it forward to help those in need, like you once were. I am embarrassed these three characters leave Canada with such a bad wrap. Thank you so much for not judging the rest of us and our great country. Bless you as you continue your journey. All the best. I’m glad to hear that your bag was found and that you weren’t seriously hurt! It’s great that you can take a negative thing like this and turn it inside out and see the positive side. Continue your run, there are far more good people in this world than idiots and you have a lot of support! Glad you’re alright! We were with our family last night and saw you while the fireworks were on. Great thing you’re doing…have a great journey! The start of 2014 I felt so sick and it was not due to celebrating the new year, but to hear that my hero(Jamie McDonald) was attacked and all his possessions gone. I don’t understand why anybody would cause harm to such a wonderful man who is helping sick kids. Glad there is a happy ending to this selfish act and to know Jamie is fine and will continue on his journey here in Canada. Who knows maybe these culprits have children of their own, or will have one day. As you say, hopefully the silver lining on all this is alerting more people to your cause. I wish you great success! Fantastic! That was a horrid start to the new year and my family was feeling so sad for you. But also we were thinking that if anyone could turn this into an opportunity then that would be you! Stay strong mister. You’re doing so bloody well. You have yet more hurdles to cross and you are being thoroughly tested this week. BUT you are doing something incredible that will enrich and inform your life for ever more. This discomfort now is a part of your rich story later on so dig deep (yet again) and put this aside. Your greatest years are ahead of you, when you will feel so proud of all your wonderful achievements. Thank you Jamie for being alive and living in a whole, heart-connected way. One or two people do not make a country. I loved my time in Canada and the people are amazing. I was very disturbed to hear of the attack. What a horrible experience! As a Canadian, and an expat Scot, to have this happen at a time when traditionally one extends hospitality and good will, makes it all the more shocking. I’m really glad that your belongings have been returned. My very best wishes to you as you continue through the Rockies and BC. I hope the weather/conditions will be kind to you for the rest of your journey. So glad to hear you recovered your belongings and that you are okay. Best of luck with the rest of your journey. I’d like to know when and where in Canada you’re journey will end! I’m in Vancouver and I’m presuming that this will be your destination but it might just be in our Provincial capital of Victoria on Vancouver Island. Thank you for all you’re doing, take very good care of yourself and good luck!! Happy New Year to you Jamie and may 2014 bring you safe and amazing adventures, new friendships, love, prosperity, good health and most of all laughter!! Glad Jaimie is ok and that his belongings are safe. Good luck! I think I speak for all when I say … I am so very sorry this happened. I am so pleased to hear that you were able to get your things back. Great news Jamie. Still plugging your amazing trek over here as much as we can in the Gloucester Review and trying to get the donations up. I and my whole family think you are amazing. Praying for you all the way. All the best Pete.